It’s a good idea to hire a HVAC company to inspect and do maintenance on your system every fall and spring. They’ll do things like inspect and clean the wiring and mechanisms of the unit, which is bit more challenging for the average homeowner. Buy a better filter if you haven’t already. The new high-efficiency pleated filters have an electrostatic charge that works like a magnet to grab the tiniest particles — even those that carry bacteria. Replace the filter at least every 90 days. But check it monthly. If it looks dark and clogged, go ahead and change it. If you have pets, you’ll probably need to change every month. Check to make sure there’s at least two feet of clearance around outdoor air conditioning units and heat pumps. Weekly during spring, summer, and fall remove debris such as leaves, pollen, and twigs from top and sides of outdoor air-conditioning units and heat pumps. Don’t allow the lawn mower to discharge grass clippings onto the unit. Monthly, inspect insulation on refrigerant lines leading into house. Replace if missing or damaged. Annually, ensure that outdoor air-conditioning units and heat pumps are on firm and level ground or pads. Annually, pour a cup of bleach mixed with water down the air-conditioner condensate drain to prevent buildup of mold and algae, which can cause a clog. In summer, shut off the water supply to the furnace humidifier. In fall (or when you anticipate turning on the heat), replace the humidifier wick filter, set the humidistat to between 35% and 40% relative humidity, and turn on the water supply. 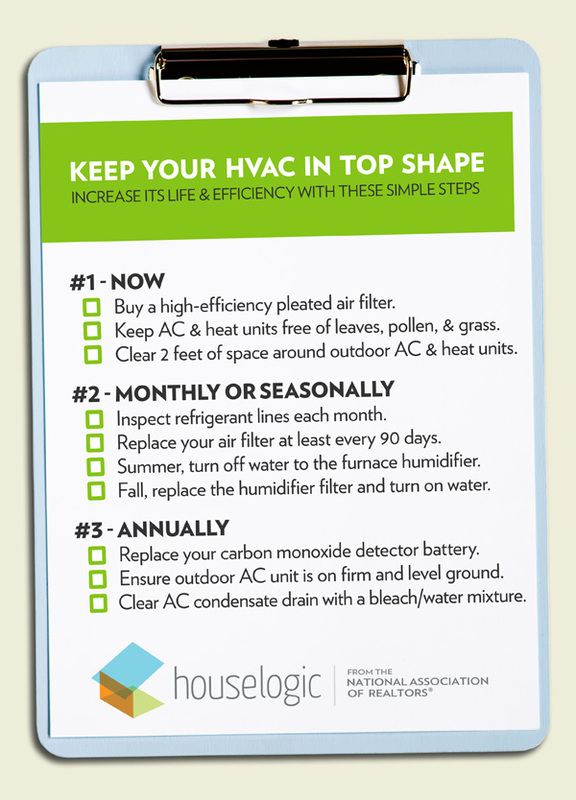 Never close more than 20% of a home’s registers to avoid placing unnecessary strain on the HVAC system. Annually, replace the battery in your home’s carbon monoxide detector.